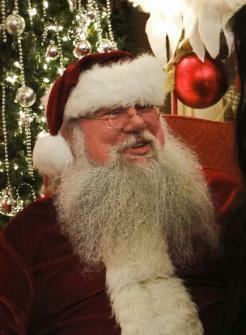 This is the real Santa, he like Clarksville and visit us every year. In honor of Santa coming, we decorate the City Hall and give him a special spot to meet the little children. The Clarksville,Mo. City Hall, transformed into Santa Land. Mountains of snow men await the little ones who have came to see Santa. Santas of all sizes and descriptions are on display. Santa arrives in our little town today.This is the first of his many visits. Several of the citizens, guided by our Mayor, have decorated the meeting room at city hall here in Clarksville,Missouri for his arrival. This is about 6 years now that we have been doing this. When we first started we had very little to work with. I donated a Santa and a Snowman collection, that I once used to decorate my house and the Mayor has added to this for many years now. Some town folks bring us and donate Santa or Snowman every now and then, making this project bigger and bigger. Several trees are decorated, a mantle and the entire meeting room is transformed for Christmas. The Mayor does most of it, she is devoted. Some town folks help out and I usually place the Santa and Snowmen. This year the meeting halls looks more beautiful than ever. It is a little thing we all do for the Children. I ventured down to the city hall shortly after Santa arrived, taking Sissy Dog for a visit. She had her letter ready and made her list and checked it more than twice. After a long wait in line, of which Sissy was a very good girl, it was our turn. It didn't take much to get her to jump up on the old jolly mans lap. He was so delighted to see her and remembered her name. After several Sissy Kisses, Santa took her list and promised that if she could be good till Christmas, some of her dreams would come true. We thanked Santa and went back to our shop, where Sissy greets all the customers. So far, she is holding her own and seems like she might be trying extra hard to be a good girl. I am sure she can do it, as she always is a really good girl. When we got back to the shop, Sissy fell asleep and started to dream about what she had asked Santa for. Rabbits to chase. I try and discourage this habit, but she loves to chase them. When her uncle Bruce,the Clarksville Dog Walker, walks her, he encourages her to chase them. I guess that is why she is so excited when Bruce shows up. Sissy would be happy to get anything from her favorite shop in New York. It is on 5th Avenue and is the latest in dog fashion. However, I would never let anyone call Sissy by that name. No! No! A new warm coat would be nice for our winter walks. Lots and Lots of good dogie treats would be appreciated. This little darling princess dog bed would be tops on my list. I don't think Daddy would like this idea, but a little brother or sister would suit me just fine. Santa please bring my Daddy lots and lots of customers and lots and lots of readers and friends on his blog. And Santa, please don't forget my two best friends. Shotgun and Basil, they have been awful good as well. They live next door, so they are easy to find. I will leave you now and I hope you will come by some time for a tour. I will leave the lights on and Sissy Dog will always greet you with a jump and a kiss. And from me and Sissy, I sure hope all your Christmas Wishes come true. And remember all the fur babies out there, they are helpless and always give so much back. God Bless the Little Children and the Animals. Merry Christmas from Sissy Dog! Welcome to Richard's Great Stuff in Clarksville,Mo. A girl has to take a break sometimes. There just might bea bunny rabbit in here.